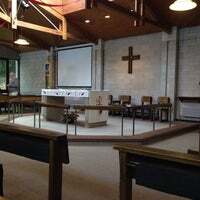 This is my Dads church, although it was my church between 1974 to 1978 when I lived with my parents. I have even been on this church’s PCC. I spent the day by taking the bus from Huddersfield, which conveniently arrives in time for the service, Dad and my brother Phillip were already there, them lunch at the Woolpack at Whitley Lower before going back to Dad’s and watching the Austrian Grand Prix followed by what was left of the World Cup match between Spain and Russia – Russia progressed to the quarter finals on penalties. I was welcomed at the door and shown where Dad and Phillip were sitting, which was Dad’s usual pew. I am recognised because I am an infrequent visitor, though unfortunately not in the last 6 months except for a funeral. Also the end of the service: The Sunday school children, as the Gospel had taken place on a walk, had had their teaching whilst out on a walk, the weather being hot and sunny. The after service cup of tea wasn’t too weak either.